What is this game with the player character flying with purple wings? I'm trying to find the name of the game because I think it looks really good. I think it's for iOS, but if not please mention which platforms it's on. 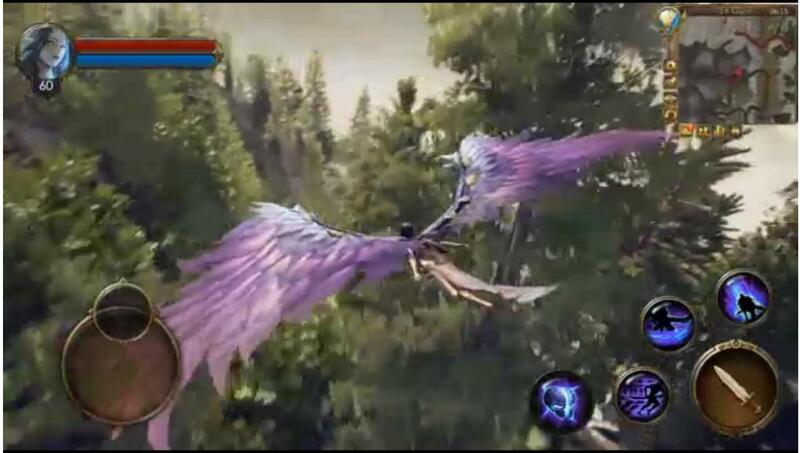 Appears to be a game called Legacy of Discord: Furious wings. You can see some of the gameplay in this video at around the 1:38 mark (as well as what may be your screen shot around the 2:02 mark). Oddly, the video itself has it labeled as "Legacy of Discod: Furies Wings" but when typing in "Legacy of Discod" Google was suggesting the other title. As suggested, it is available for iOS (and also android). Which game is this 2D character sprite in a battle stance from? Which game is this animation of a guy with a green shirt, backpack, and blue pants from? What game is this sprite of a blue-haired character pushing a fruit from? Can someone recognize this game from a laptop commercial? What character is this and what game is it from? What is the name of this old GBA game? What game is this soldier from?